Ambulance Chasing: Not Just for Lawyers! 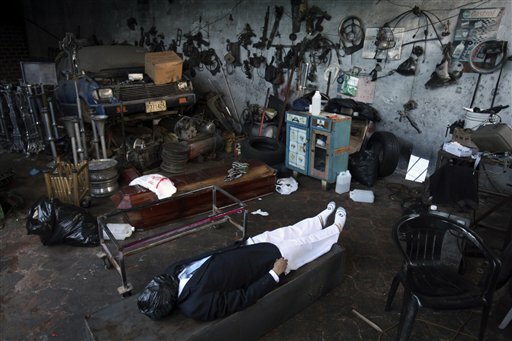 With its excess of murders and dearth of death practitioner regulation, Guatemala is home to “mobile morticians,” chasing ambulances and staking out city morgues to be the first to pounce on mostly low-income, grieving relatives. 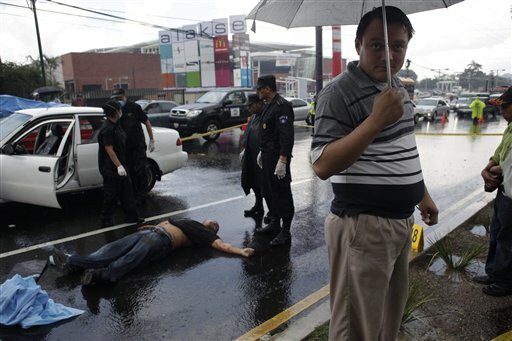 They’ve even earned a deathly moniker: “calaqueros,” or skullmongers, as seen holding the umbrella below, patiently waiting for a wallet to arrive. Not only will they track you down in disturbing, often offensive ways, including paying the police to tip them off, skullmongers set up shop wherever possible, including auto body shops: caskets sold up front, corpses disemboweled and embalmed in back among the engine blocks. This seems to drive costs down (at least? )… but back-alley embalming can’t be far behind. See the AP story (linked at top) for a number of additional photos. Posted by Meg Holle in Death + the Law, Death Ethics, Funeral Industry and tagged funeral directors, funeral homes. Bookmark the permalink.